Old Lyme, CT, is usually praised for its turn-of-the-20th Century Artists Colony, its picturesque downtown and its proximity to the beaches. Over the past 8 months, music lovers have been heading there just about every weekend to check out the sounds at The Side Door Jazz Club at The Old Lyme Inn, 85 Lyme Street. This weekend (2/7 & 8/14), pianist Fred Hersch returns to the club with his excellent Trio in tow (which usually means bassist John Hebert and drummer Eric McPherson.) While there seems to be a million piano trios in existence, few are consistently as elegant, exciting and musical as the one led by Mr. Hersch. Blending original material with standards and, at least, one tune from Thelonious Monk, the Trio is at its best in a live setting. Chances are good that this show, like many at The Side Door, will sell out (if it's not already) so call them at 860-434-0886 or buy online at thesidedoorjazz.com. Another ticket that is bound to be tough to get (but do try) is to the duo of Sara Gazarek (voice) and Josh Nelson (piano). They are performing on Friday February 7 at 7:30 p.m. as part of the Music @ Japanalia series held at Japanalia Eiko, 11 Whitney Street in Hartford. Ms. Gazarek, whose repertoire covers many facets of popular music (from The Beatles to Broadway to Blossom Dearie and beyond), has a voice that brings lyrics to life, filled with honesty and emotion and no artifice. Mr. Nelson, who has worked with the vocalist since 2004, has toured with Natalie Cole as well as the Hollywood Pops Orchestra. He has appeared on all 4 of Ms. Gazarek's CDs including 2012's brilliant "Blossom & Bee" (Palmetto Records). The duo is in the midst of a tour that also takes them to The Iron Horse in Northhampton, MA. on February 9. For tickets to the Hartford gig, call 860-232-4677. The Uncertainty Music Series continues on Saturday February 8 at 8 p.m. in the performance space of Never Ending Books, 810 State Street in New Haven. Series curator Carl Testa has scheduled an exciting double bill that pairs thingNY, an experimental music sextet, with guitarist/saxophonist Colin Fisher. Mr. Fisher, who also plays bass, banjo, melodica and slew of other instruments, is an active member of the Canadian "New Music" scene having worked in performances with Anthony Braxton, guitarist Rhys Chatham, bassists William Parker and Dominic Duval, saxophonist Joe McPhee, and in groups such as Sandbox and the AIMToronto Orchestra. His recordings include "Little Man on The Boat" (a duo with multi-instrumentalist Jean Martin) and "The Localization of Noise and Its Endowment with Form" (a duo with guitarist Simeon Abbott.) To find out more about Colin Fisher and his music, go to www.facebook.com/pages/Colin-Fisher/6601082971. thingNY (pictured above) is an ensemble (in its own words) "of composers-performers who create and perform theatrically charged experimental music, champion the work of avant-garde and contemporary classical composers, and collaborate across disciplines, medias and genres." For this New Haven performance, the ensemble will perform "Glue Piece", excerpts from its opera-in-progress "This Takes Place Close By" that includes compositions from group members Paul Pinto (voice, percussion), Erin Rogers (saxophone), Dave Ruder (clarinet) and Andrew Livingston (bass). Filling out the group and the sound will be vocalist Gelsey Bell and violinist Jeffrey Young. 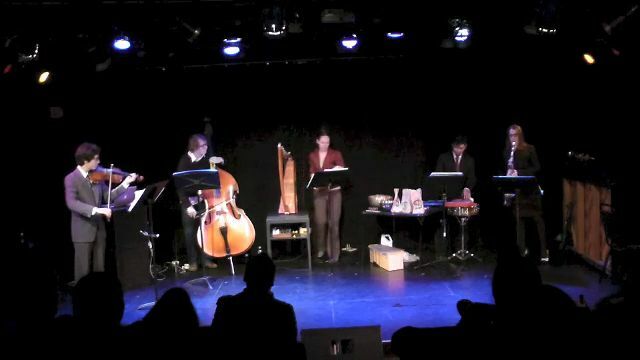 To find out more about the ensemble, its performers and its music, go to www.thingny.com. For directions and a list of upcoming shows in the Series, go to uncertaintymusic.com.